Scottish Rite Masonic Museum & Library: Are the National Parks Better in Stereo? Are the National Parks Better in Stereo? Stereo cards, also known as stereographic or stereopticon cards, were among the most popular photographic media in the United States from the 1860s to the 1930s. A stereo card consists of two virtually identical photographs of a given subject that are mounted side-by-side on a rectangular card. 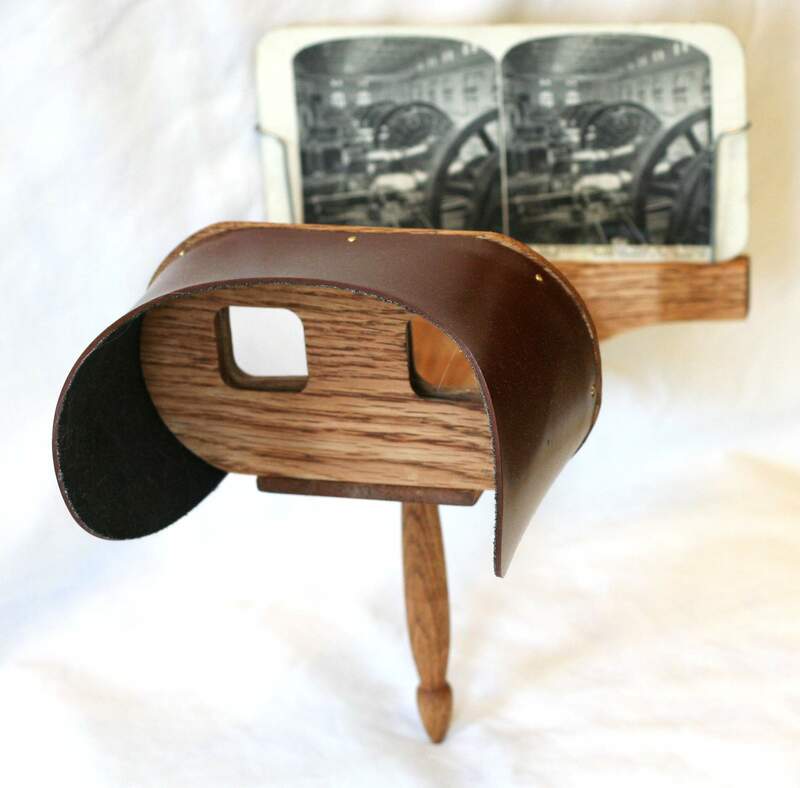 When viewed through a special device known as a stereoscope, the two images would project a single, larger, three-dimensional image of that subject. The National Heritage Museum has almost 200 stereo cards in its collection, including several that depict national parks in the western United States. Both of the stereo cards pictured here show scenes from Yosemite National Park in California. The first shows the Fallen Monarch, a deceased giant sequoia tree that can still be seen today in Mariposa Grove at Yosemite. The card was published in 1908 by the Keystone View Company, one of the leading American suppliers of stereo cards in the early twentieth century. This stereo card is a relatively uncommon example, because it is a hand-colored photograph. Photographers in the late nineteenth century occasionally hired artists to tint a black-and-white image with watercolors, oil paints, or dyes. While hand-coloring was something of a novelty for American photographers, it was very popular in Japanese studios during this period. The second card, published in 1867 by the noted early Western photographer Carleton E. Watkins (1829-1916), also shows a view of Mariposa Grove at Yosemite. Typical of the stereo cards of the American West in the Museum’s collection, it is not hand-colored and does not depict any people. Instead, its primary focus is the majesty of the Western landscape. Although there were no true national parks in 1867, when this photograph was taken, California had already set aside part of the Yosemite Valley as a state park. In 1890, Congress established Yosemite as a national park. Viewing stereo cards was a common pastime during the late nineteenth and early twentieth century. Many upper- and middle-class Americans living in that period owned a stereoscope. Ultimately, however, stereo cards declined in favor of newer technology. Handheld cameras like the Kodak Brownie, invented in 1900, allowed anyone to take snapshots of their favorite scenes. By the time that the Keystone View Company ceased its regular production of stereo cards in 1939, motion pictures were already enormously popular with the American public. Stereo cards were unable to compete with the social, cultural, and audiovisual experience of going to the movie theater. To see photographs of the national parks as they appear today, please visit our current exhibition, Treasured Lands: The Fifty-Eight U.S. National Parks in Focus, which is on view through October 17, 2010. Burns, Ken, and Dayton Duncan. The National Parks: America's Best Idea. New York: Knopf, 2009. Gilbert, George. Photography: The early years: a historical guide for collectors. 1st ed. New York: Harper & Row, 1980. Runte, Alfred. National Parks: The American Experience. 3rd ed. Lincoln, NE: University of Nebraska Press, 1997. "The Kodak Brownie at the Franklin Institute." The Franklin Institute History of Science and Technology. The Franklin Institute, 2010, http://www.fi.edu/learn/sci-tech/kodak-brownie/kodak-brownie.php?cts=photography-recreation, accessed March 31, 2010. "Welcome to Carleton Watkins Stereoviews." Welcome to Carleton Watkins Stereoviews, http://www.carletonwatkins.org/, accessed February 28, 2010. Top: The Fallen Monarch, Mariposa Grove, 1906, Keystone View Company, Pennsylvania, New York, Oregon, United Kingdom, Australia; collection of the National Heritage Museum, Gift of William Caleb Loring, 88.38.25. Bottom: In the Mariposa Grove, 1867, Carleton E. Watkins (1829-1916), California, collection of the National Heritage Museum, Gift of William Caleb Loring, 88.38.62.